From Glasgow Ontario (Google Map it) just South-West of Uxbridge, take Webb Rd East to Concession Rd #3. Take Conc #3 North (left turn from Webb) to Secord Rd and turn East (right). While researching this one before walking it, I read numerous warnings about the mosquitoes. So, the Wife and I held onto it until early December. The forecast was for a lovely sunny day. Which it probably was … above the fog. But then, the sun can’t shine every day and we were there anyway, so we walked it despite the poor photo op. There was something about the big map at the trailhead that gave me cause to wonder. By the time we’d finished the 1st trail, I knew why I wondered about it. The map below is pieced together from the few parts of that map that were correct, satellite views, my pictures, and recent personal trail experience. ie – don’t bother trying to make sense of the trailhead map. There are only two trails at this site, and they’re complete opposites. I used the trailhead map below, but added the correct trails and removed the non-existent ones. Take it to the right from the trailhead kiosk. This is an ORTA side trail, so the blazes on trees and posts will be bright blue. You’ll walk a short distance through a meadow and emerge onto the road you drove in on. Once you walk the road over the dam/bridge and along the shore of the pond on your left, you’ll come upon a few private property signs explaining that the road becomes a driveway, not a turnaround point. The trail is on your right, clearly marked with bright blue paint blazes. Follow the trail until you come to a cross-trail entering from the left. The sign will say “MAIN TRAIL TO CONC 4” with an arrow pointing left (and another arrow pointing straight ahead stating “MAIN TRAIL TO GOODWOOD TRACT”). Remember this sign as it will take you to the 2nd trail in this WA – reviewed next. Take the trail to the left to begin the approximately 5 km Main Trail loop (the trail blazes turn white at this point). The trail is fairly level lowland wetlands with many boardwalks making an otherwise inaccessible terrain traversable. There are a few meadows and upland woods thrown in there though. Someone had posted a hand-made sign designating a section of this trail “The Orchid Trail”. The terrain was very similar to other trails we’d seen cypripediums on, so we’ll be returning in late Spring/early Summer to search for them. As you approach Concession 4, you might hear some traffic noises. Otherwise, this trail is remarkably quiet (save the incessant Southern Ontario Cessna). At this point, you’ll notice the trail makes a 180° turn and you start looping back the way you came. You’ll find yourself entering an open meadow with a post bearing blue blazes again which will direct you to the left. There’s an interpretive sign just past it explaining “Battling Climate Change on the Farm”. There’s a trail that appears to continue past the sign, but it just goes up to the road. Once you make the left at the blue blazed post, you’ll enter a lovely, quiet canopied stretch, so silent, the only sound will be the trickling of the stream. After more boardwalks and a bridge, you’ll have to climb the only serious hill on this trail. It’s steep, but not impassable. Once atop, you’ll only walk a short distance before plunging back down into deep forest with even more impressive boardwalks than you’ve experienced thus far. In time, you’ll come upon a clearing with an old barn. The blue blazed post will direct you to the left, onto what is obviously a bushroad. Follow this road back to a spot just slightly North of the lot you left your car in (your car is easily visible/accessible from there). 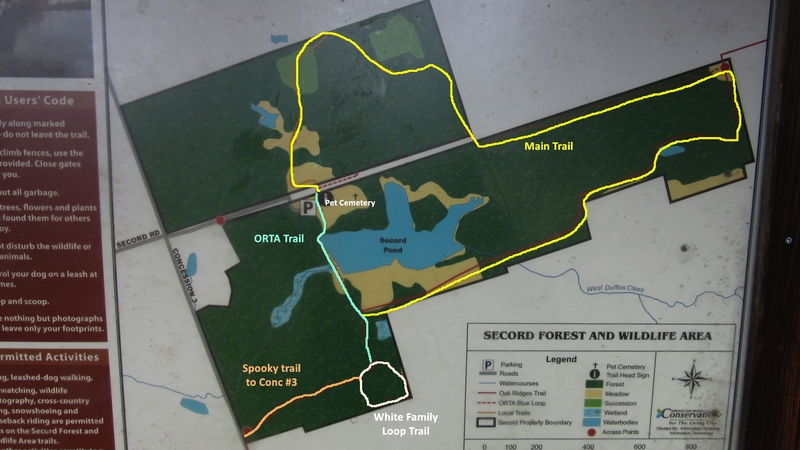 From the sign mentioned in the 1st paragraph of the Main Trail review, take it straight ahead where the sign says “MAIN TRAIL TO GOODWOOD TRACT” (but makes no mention of the White Family Side Trail). As you walk this trail straight ahead, you’ll come across a sign stating “The White Family Side Trail”. And I can tell you, the White Family must’ve had legs like kangaroos ’cause that’s one damned hilly 400 lousy meters ! Then we found evidence of a sweet tooth in the family, when we ran across a maple sugar boil-down operation. After climbing the second (and final) hill on this trail, you’ll see a trail heading off to the left into a very spooky looking forest that walks through more fake forest to emerge on Conc # 3 right beside the residence @ 2501 Concession Rd. 3. From there , you can walk to Goodwood CA (which I wouldn’t suggest you do, as I slammed it mercilessly at the end of this review The Glasgow Loop). Just continue to the right, and you’ll return to the sign where you started . Go left from the trailhead kiosk and turn right on the wide trail. This cemetery was a lot bigger than I expected. It kinda tugs at the heart strings, and made me feel sad. Other than using it as a starting point, don’t even bother looking at the map at the trailhead kiosk, as it’ll just confuse you. It might be a good idea to avoid this one after a prolonged rain too. The ground between the numerous boardwalks was still fairly squishy in early December after a few weeks without rain. The trails are fairly evenly split between walking single file, and two walking side by side. There are only two trails. The Main Trail is mostly lowlands with the highest concentration of boardwalks we’ve ever seen, anywhere. The White Family Trail is steeply hilled, but short (400 meters). Both are loops. There are no “Local Trails” as the trailhead map suggests. I think the local trails were absorbed/overtaken by the creation of the Main Loop Trail (and the trailhead map was never updated to reflect the change). There are no facilities of any kind, anywhere, on these trails and no charge for parking. We made a few visits here before writing this review, and (unfortunately) the parking lot looked like an open garbage dump on all occasions. Don’t let that deter you though. These are a coupla lovely trails once you get past the parking and fishing areas. Spooky forest looks like fun. Great photos and review (as usual). Will get out there as soon as I can. As always I am saving your posts as plans. Thank you kindly Kevin, so gracious of you to say. I’d suggest you give this one a wait ’til early Summer though. The hills would be very difficult to scale in snow &/or Spring thaw, and it’s famous for it’s mosquitoes come mid Summer.